For those of you swimming around inside your father’s scrotal cavity in 1993, the DOOM series has been a benchmark for FPS titles (First Person Shooters for those of you not au fait with the wonderful world of the video smile machines), a standard which few games have surpassed. 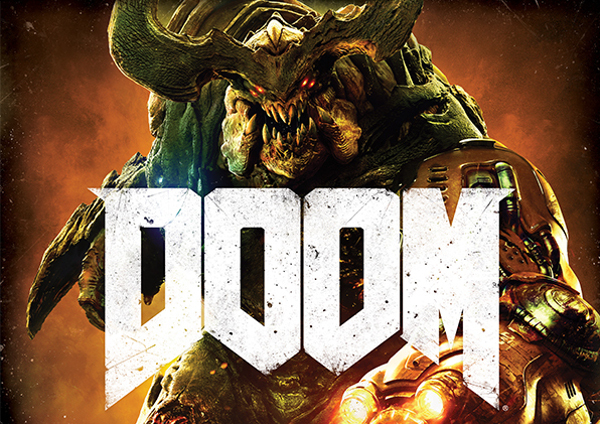 id Software are renowned for making solid game engines and DOOM was their breakthrough title. It’s spawned (pun intended) a legacy of sequels, updates and remakes around the canon – all usually involving an unnamed soldier (the DOOM Marine) running around a Martian base trying to repel the forces of Hell back from whence they came. Rather like closing time in a one-club town, there’s a lot of ugly mutants wandering around attacking the authority figures and wondering why they get a beating, before being sent back to the holes they came from. In this era of constant remake, reboot and rehash, even this stalwart FPS has succumbed to the ever-marching tide of progress and it was taken on by Bethesda Softworks to update the game with modern graphics, a twist on the plot and another excuse to cash in on the franchise. I must admit a slight hesitation on playing the video game, as reboots rarely see the creative lightning strike twice, but in this case, like an alcoholic kleptomaniac with dysentery, Bethesda successfully captured the spirit of the original with the benefit of making everything look reddish brown. 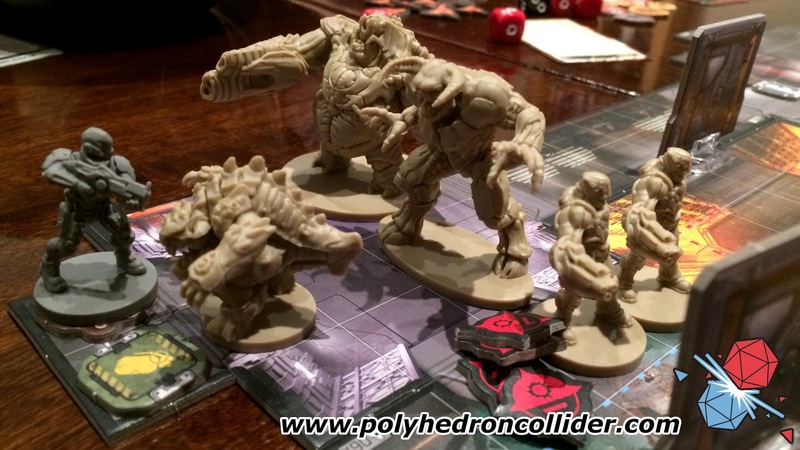 And whilst on the subject of cashing in, it seems that practice isn’t beneath Fantasy Flight Games either with their recent 2016 release of DOOM: The Board Game. 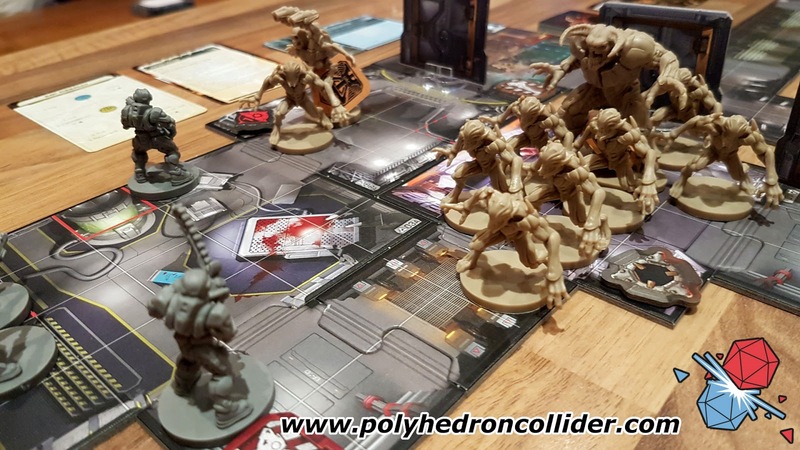 I won’t lie (in fact my straightforward, uncompromising nature is one of the reasons Steve allows me to do this), I was drawn to the DOOM board game as I’ve been impressed with the PC version. Additionally, with Steve having an insane and yet slightly apposite obsession with all things Arkham and Lovecraft and me liking hefty games involving more procedures than a mission to Mars, we at Collider Towers are quite partial to a bit of Fantasy Flight Games in our lives. So I bagged DOOM and psyched myself up for a bit of demon spawning, fragging and an encounter with creatures large enough to leave even the most hardened of marines with the need for a new pair of pants. 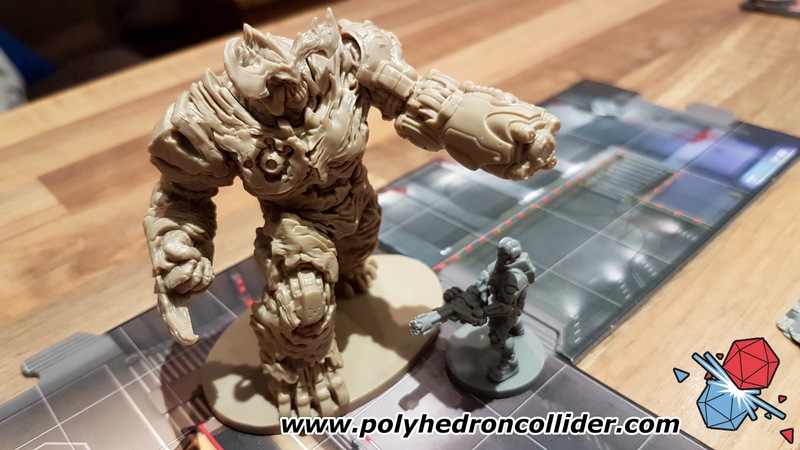 Upon opening the box for DOOM, we are greeted with a familiar sight for FFG products – two manuals (Learn to Play and a Rules Reference), the standard fayre for their games these days. A myriad of cards, large and small, sections of map with jig-cut connections and a bag of well, I would say miniatures, but a few of them aren’t that “mini”. It’s all very pretty and well-made as you’d expect from Fantasy Flight. Being a fan of the original game, the iconic character of DOOM is of course the Cyberdemon, so I like an overexcited game show contestant after 8 large cappuccinos, I went straight for the prize and almost wet myself. The miniatures in general are extremely detailed and a good replica for the PC game, plus they carry a good bit of weight behind them. A true engineering test. Contrary to the digital version, DOOM is actually a (vaguely) strategic, mission based campaign over several scenarios. The more creative players are free to set their own games up though and the rules are good enough to outline how this is achieved. The game is actually played as a one vs. many format – one player playing the “Invaders” (demons from Hell) and remaining (up to four) players each taking the role of a marine. The invader player takes up the mantle of running the game, although “running the game” holds about as much reverence here as serving the tea at a local PTA meeting during the summer holidays. The idea of initiative in DOOM is tackled by a random mix of cards, each representing the marines (one for each) and a number of invader cards (one for each type of demon). That way, each turn is unpredictable and it can mean the difference between getting a sneaky quick shot to take out an Imp or standing in the middle of the room picking your nose while the enemy horde comprehensively blows you to Wonderland. Which, like a perfectly executed power slide, moves me effortlessly into the parking space of combat. The shooting in DOOM can be either explosive and over quite quickly (like the PC game) or a slightly more drawn out affair, like waiting for the aforementioned parking space to be cleared by someone's batty old grandma. Actions are card-driven and some (but not all) marine actions can permit shooting, which vary with chosen weapon loadout. It’s a bit simpler for the Invaders as each demon has their own stats, but their abilities can be embellished with Argent Energy, Hell’s universal power source (and the reason the portal to Hell was opened in the first place for those interested in the canon). Marines play a card, move the number of spaces permitted then unleash spurts of wonder in the direction of a chosen demon. Dice are rolled and spots are counted in the usual manner, but in this case the game represents the toughness and agility of targets with a defence draw from the player deck. Each card has a number of shields on (0-3), representing negated spots so damage is reduced (or avoided entirely if you get a dodge symbol) and this is where, like the morning after a night on the Guinness, things can be more traumatic to those involved. Common targets like Imps, Possessed Soldiers or (bizarrely) Cacodemons have comparatively fewer hit points and a single shot from a Super Shotgun can return the hellspawn from whence it came. However, for the big lads and marines, negating 3 or 4 damage (and the infuriatingly powerful Armour response for the marines) can make a shooting match take quite a few turns requiring a bit of thought around your available marine actions. Each card has some or all of movement, weapon range and damage stats and it’s down the player to decide how to use them. Cards are drawn from a deck so strategy isn’t something that can be done with the long term in mind. I quite like this mechanic as it reflects the frantic nature of the reference game. When demons spawn, you don’t have time for a committee meeting to determine how you’re going to leverage their synergy – you’ve got to get stuck in and repaint the walls with the new Dulux colour range; hint of brain, intestinal relocation and limbless detachment. From the Invader point of view, beating seven bells out of a marine with a Baron of Hell is highly entertaining and shrugging off his pitiful retort did feel rather cathartic. Swamping one with a veritable dogpile of Imps like a crowd of teenagers asking for an autograph is also a valid approach. I do feel the Cacodemons are a little weak however – they’re quite formidable in the video game, especially their attacks, but they don’t seem to pack the same punch in the cardboard version. Scaling DOOM for fewer than 5 players is handled with the addition of abilities to give the marines a bit more oomph. Via the power of a small card, each man-tank is given a few more Mars bars and a can of Red Bull to allow him to introduce the outpouring of the Christian afterlife to the business end of a Combat Shotgun or shove a Syphon Grenade into a Pinky’s infernal abyss, step back and enjoy the show. Also, once a demon has received the kind of beating that only drinking a 6-pack of Tennent’s Super can invoke, you can finish the hapless shambles off with a Glory Kill which provides a short-term power up, again capturing the video game elements rather well – although I feel they’ve made the Imps a little too weak here. Rather oddly, it seems that the balancing made by the squad cards are a wee bit too powerful – a 4 marine game feels right whereas a 2-marine game allows the soldiers to chop up the demons like they’re the main course at a Toby Carvery. There are some combos of cards that can be very effective when played correctly, however a double action for each marine due to the balancing means that they can reduce Mancubi and Barons of Hell to large red clouds in a single round, making the game a trivial matter. 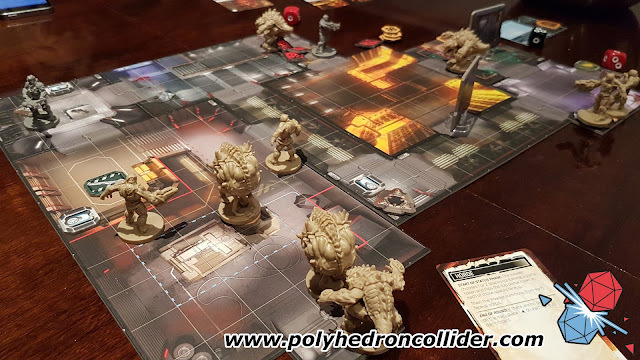 The format and appearance of the game is where DOOM really shines: the maps are defined before play starts, although as mentioned, the players are free to design their own maps and marine loadouts which adds considerable replayability to the game. There’s a very distinct feel of “Space Crusade” here which holds fond memories and one of my first introductions to tabletop games, back when I was Jimmy Savile’s ideal dating age. Each mission has objectives for the marines and for the Invaders so you don’t just continue infinitely on like an indigestible Ouroboros. Faithful to the base material, demons spawn through portals placed throughout the map, the contents of which are at the relative behest of the Invader and the individual mission parameters, so you may spawn a pack of Imps or an army of Revenants to deal with the UAC’s finest depending on how sassy the Invader is feeling. Objectives can be pinned to enemies adding a cat and mouse element which can be entertaining. It probably helps that I’m very familiar with the source material for DOOM the board game, but overall, it hits the right notes and I love this translation from pixels to cardboard. There’s a good sense of action although it is, rather unavoidably, slightly slower paced than the digital version. 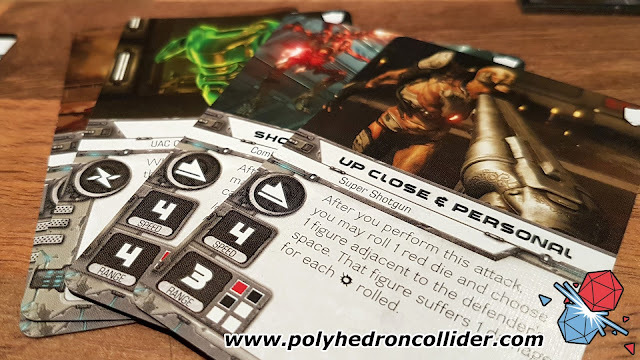 DOOM has always been about fast, relatively mindless action and this offering adds considerable, but not unwelcomed, thought to the proceedings. The game is robust, configurable and very pretty. Plus, the figurines are very faithful to the original Bethesda material which certainly adds to the atmosphere. I picked this up for less than 60 quid, which considering the number and size of the miniatures, is a bit of a bargain, especially compared to a lot of the other FFG mini-based games. It can be a bit of a faff to set up due to the bespoke maps and the building of all the decks, but it’s not a dealbreaker. So like a Texan evangelist at a Sunday barbecue, get ready to banish your demons.